The cool part – you could win this eBay auction to get a copy of A Link to the Past for the SNES signed by its very creator, Shigeru Miyamoto. 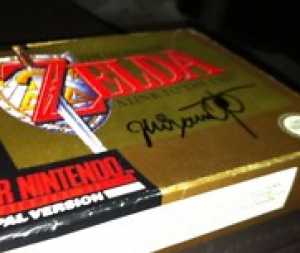 The bad part is that there’s no real proof that it is authentically Miyamoto’s signature. It is currently selling for about $110US, and has four days to go. You take a chance with that one. Even cooler than that is this rare Wind Waker scroll from the opening sequence of the game. If you want this you’re going to have to be keen, because with two days left its buy it now price is at $1,600US.